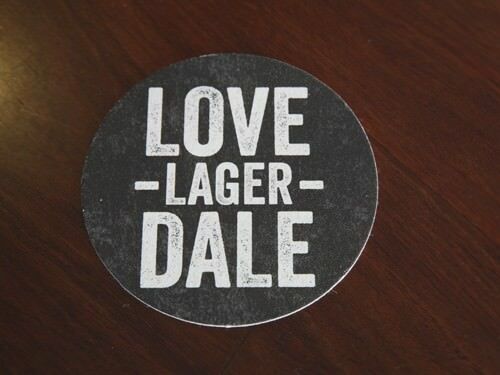 Lovedale Brewery is located on the grounds of Crowne Plaza Hunter Valley. 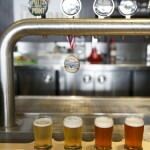 It developed from the Schwartz family brewery in Sydney and is already enjoying a huge success at it’s Lovedale home. 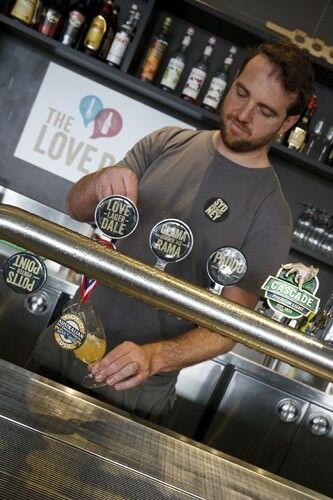 Just two months after brewing commenced in the Hunter Valley brewery, the team won “GOLD” for their Lovedale Lager in the Australian International Beer Awards. Under the watchful eye of Michael Capaldo the brewery also won three bronze medals. 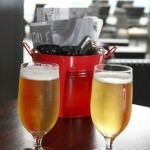 The successful beers were the Glamarama Summer Ale, Newtown Bitter and Potts Point Porter beers. 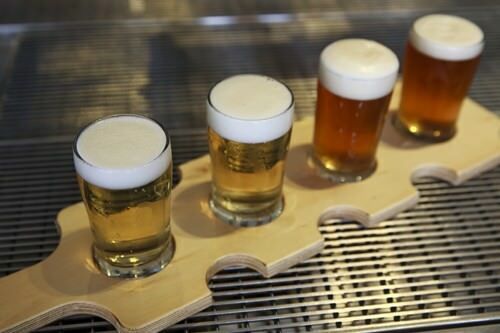 With four awarded beers under their belt the brewery is a definite draw card to the property and a credit to the team. 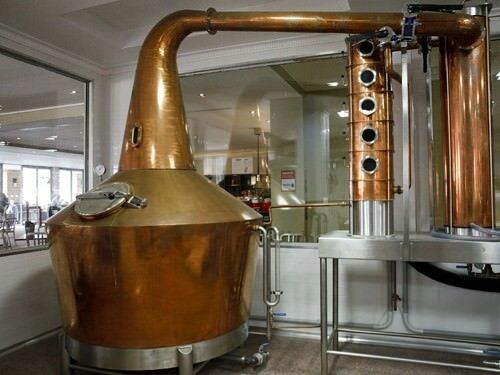 Whilst sitting in the bar, you can watch the beer being made in the brewery, through large glass viewing windows. 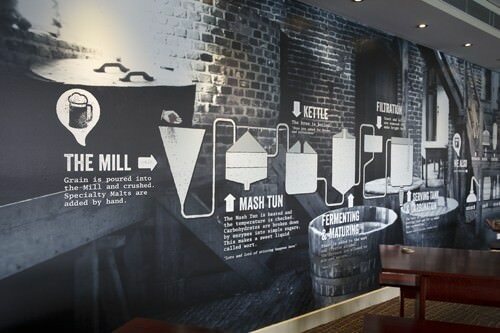 Along the length of the walls are images which outline the beer making process. 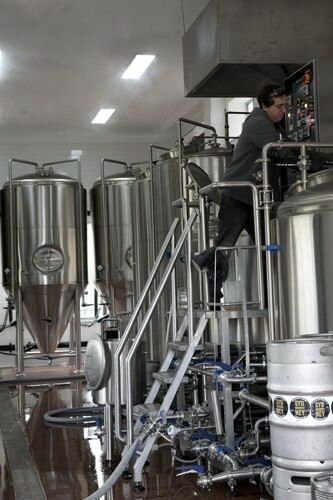 We also very pleased to learn that the beer is piped directly from the tanks in the brewery to the bar taps! Michael explained the reason for piping the beer is the less processes the beer goes through, the more flavour is in the end product. 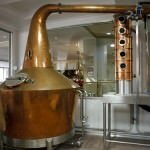 The brewery has the capacity to make 8 different types of beer and cider, and can produce up to 200,000 litres per year. 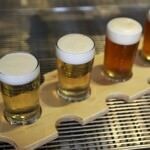 Maintaining beer production is important as the beer is supplied to all the Schwartz properties for guests enjoyment. 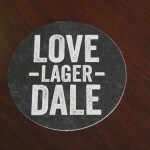 With the beer theory behind us it was time to wander into the Lovedale bar with Michael and sample a few beers. We started with the Sydney Cider. I’m not usually a Cider fan, as I usually find them overly sweet and lacking in flavour. The Sydney Cider was crisp, clean and full of fruity apple flavour. I was an instant convert. Michael explained the cider is made by crushing apples and then fermenting them with “Champagne yeast.” Yes, that means REAL yeast from Champagne! Amazing! The flavour was exquisite! Before we tried our first beer I asked Michael which was his favourite? I told him we have 5 children. He asked me, “Which is your favourite?” I laughed, it was a good point. All these beers were handcrafted and a labour of love. It was very much like a child. 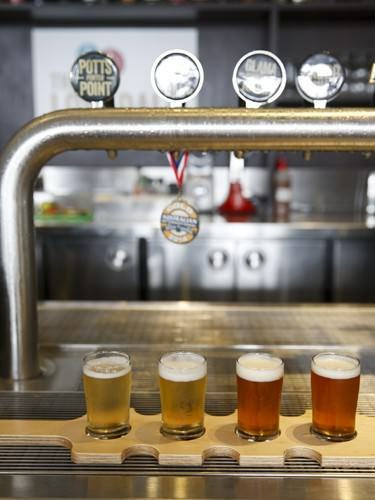 We started our beer tasting with the Surry Hills Pils. The Pils has been the brewery’s biggest seller for the past two years and it’s easy to see why. The flavour was deliciously floral and fruity with just the right amount of bitter. 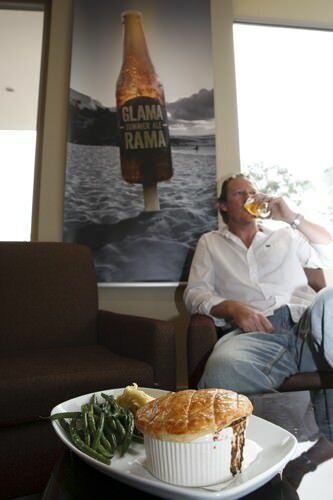 We moved along to the Glama Rama, Summer Ale, named after the Sydney suburb of Tamarama. This is a fruity styled beer which includes hops from America, Japan and New Zealand hop to get a unique tropical fruit flavour. It’s a crisp clean beer which is perfect for summer, as the name implies. Marketed with the witty statement, “You may be squeezed out of the property market but there is always room at the pub!” The Paddo Pale is an American style Pale Ale. It’s a floral beer which develops a full malty flavour on the palate. The beer is produced using a dry hopping technique which involves adding hops after fermentation. 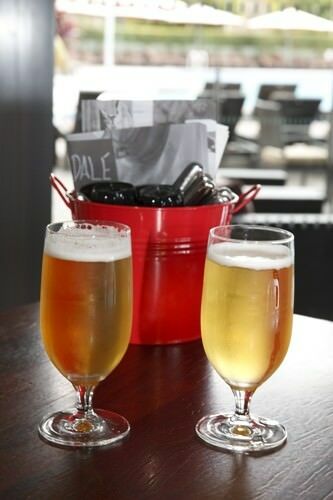 With the tasting concluded Mr GG and I chose our favourite beer, for me it was the Surry Hills Pils and Mr GG the Paddo Pale. 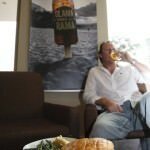 We found a comfortable seat on the lounges and perused the Lovedale Bar & Restaurant menu for a bite to eat. 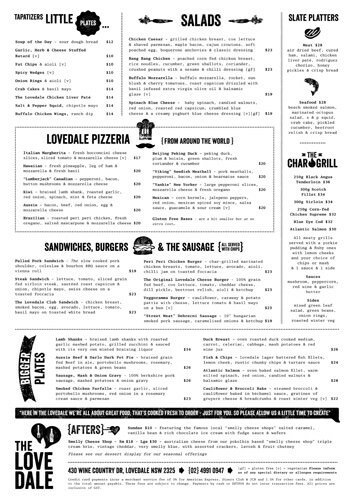 The restaurant menu has been designed to compliment the beer. 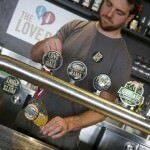 Its full of pub favourites such as pulled pork burgers, Lovedale Lager battered fish and chips and good old bangers and mash. 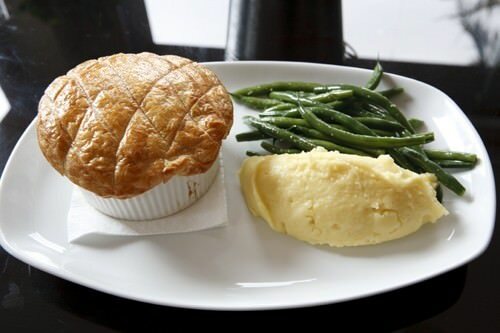 Michael had recommended the Aussie Beer & Darlo Pot Pie. 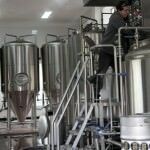 He told us the chef comes into the brewery each day to get the Darlo Dark directly from the tanks to use in the Pot Pie. The chef told us Michael in turn comes into the kitchen each day to get hold of one of his Pot Pie! 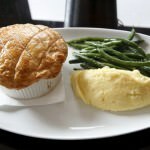 With a recommendation like that we had to give the Aussie Beef & Darlo Dark Pot Pie a go. The golden crisp flaky pastry concealed chunks of beef which had been slowed cooked in the Darlo Dark Ale. The meat fell apart in my mouth. The gravy was thick, rich and supremely beefy. It was the ultimate comfort food for this wet Hunter Valley day. You might remember Mr GG’s having raptures over the creamy, smooth mash at Redsalt. Lovedale Restaurant and Bar is downstairs from Redsalt and they serve the same mashed potato. It was lush! The seasoned, buttered green beans were a nice addition to the plate. The dish was simple and honest, but big on flavour and comfort. 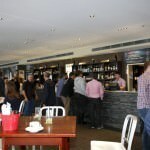 Having had a warming bite to eat, it was time to brave the weather, and do some Hunter Valley wine tasting. 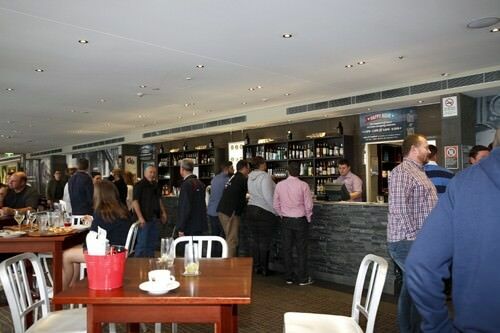 Gourmet Getaways would like to thank the Crowne Plaza Hunter Valley for their generosity in hosting this tour. As always the opinions contained in this review are written without bias and in accordance with my disclosure policy.